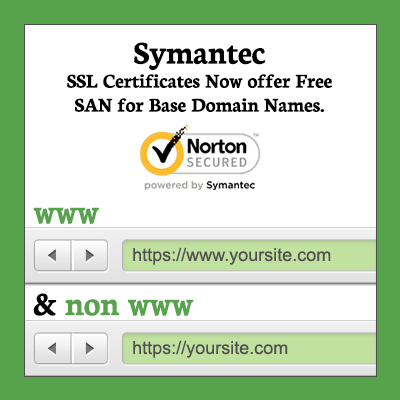 Symantec SSL Certificates Now offer a FREE SAN for Base Domain Names. The world’s most trusted online security brand Symantec has just announced that they will now secure www & non-www domain names with single SSL certificate & it will be considered the same FQDN! This is big news for us and all of our partners and customers. Finally, all Symantec SSL certificates will now consider the base domain as a free SAN or Subject Alternative Name, which simply means you can secure both versions of your website, www.name-of-site.com and name-of-site.com with single Symantec SSL Certificate. This is any easy thing that will reduce your cost and time to manage multiple certificates for one website. As the world’s leading brand, Symantec is always thinking about their partners and customers’ well-being and implementing new features like this to provide the best web security solutions on the planet. Symantec SSL certificates secure the majority of websites in the world and boasts the strongest encryption, unparalleled brand recognition, free Norton secured seal, which is just icing on the cake if you ask me. When you enroll with Common Name as www.name-of-site.com , Symantec SSL now automatically secures and adds the non-www version of the same domain (name-of-site.com) as a SAN for free. When you enroll the Common Name as name-of-site.com, Symantec will automatically add www.name-of-site.com as a free SAN. For a wildcard certificate: When the enrolled Common Name is *.name-of-site.com, Symantec will automatically add name-of-site.com as a free SAN. Symantec SSL will add the common name’s base domain as a SAN value for all certificates where the common name begins with “www” and does not contain sub-domains. –  Of course, it will only be added if TLD is valid. Add base domain as a SAN value? Symantec SSL certificates automatically add “www” to the common name’s domain as a SAN value for all certificates where the common name is a simple domain name without any sub-domains. Symantec SSL Certificate automatically add the common name’s base domain as a SAN value for all certificates where the common name is wildcard and does not contain sub-domains. *GeoTrust already offers domain.com as a free SAN when the common name is www.domain.com, but will now also add www.domain.com as a free SAN when the common name is domain.com. Google recently announced the https certificate update to its search algorithm, it will directly impact on your website ranking, if your website carry the SSL Certificate then you will get the “Google Ranking” boost up. But think why Google is giving the more important to websites which has an SSL Certificate let me explain you. An SSL Certificate is create a secure layer between your web browser and visitors’ web browsers, and making important data like banking & personal details in encrypted format. As phishing attacks are increasing nowadays, online security is major concern for the world. Google believes that by penalized the websites which don’t have an SSL Certificate, owners of the websites create the benchmark that show users are more likely to visit a websites which are secure with “https” and by this way people become more aware about online web security and the companies are pushing their website with https certificate. Any authentic website without an SSL Certificate will see the impact of Google’s update immediately, as they decrease the organic traffic for their website and ranking. This could be disastrous for the online firms who do not upgrade their servers and website with SSL Certificate. The decrease is to effectively bury potential ‘scam’ websites at the bottom of search results, as Google believe those without SSL certificates are likely to be run by people looking to mine personal data for spam or fraudulent purposes. As we’ve already explained, a low ranking on Google could sound a death knell for online business, which are looking to attract new customers who search for online services or products. If you’re unsure if you have an SSL certificate or not, go to your webpage and look at the address bar. If your web address starts with ‘https’ and you can see a padlock symbol in the address bar, like the one above image, then you have an SSL certificate. If you do not see either of these then speak to your web hosts ASAP about upgrading your server as soon as they can. If you are new and don’t know anything about SSL Certificates, you no need to worry about it. You can easily buy an SSL Certificate by selecting 3 options through “SSL Wizard”. Why Symantec SSL Certificates are the Most Trusted SSL Certificates in the World. Internet security never looked the same after Netscape Communications created the SSL certificate in 1994. Looking at the Internet’s growing popularity then, it was easy to see it becoming a dangerous medium in not-so-distant future. Developers at Netscape took the cue and started putting in the effort to utilize strong encryption algorithms in the forming of an SSL certificate, to make sure the important data stored on the web is only seen by the intended parties. Thanks to their earnest efforts; today, Secure Socket Layer (SSL) certificates have become an integral element of website security, especially in case of e-commerce and banking websites. SSL certificates are issued by Certificate Authorities (CAs), who manage security credentials and public keys for the actual message encryption. As Internet users became more aware of Cyber Security, SSL certificates became the most sought after solution to fight cyber crime. And it still is today, when it comes to safely securing a website. Which is why, the average buyer today is spoiled with the numerous CAs distributing a variety of SSL certificates in the market. In comes Symantec, and now it is very easy for buyers to zero in on a highly qualified and proven CA for issuing a trusted SSL certificate. Over the years, Symantec has maintained its position of being the top trusted CA distributing SSL certificates worldwide. Founded by Gary Hendix in 1982, Symantec is headquartered today in Mountain View, California. Although Symantec was originally focused on projects related to artificial intelligence, which included database programming, etc. But its association with SSL certificate was established later on when the internet-security giant, VeriSign sold its unit of business for trust & authentication services to Symantec which not only included SSL certificates, but Public Key Infrastructure, Verisign Trust Seal & Verisign Identity Protection services. Today Symantec is undoubtedly the most trusted SSL certificate provider that continues to work diligently to create tremendous brand equity and offer a unique blend of the latest technology, protection and efficient, yet extremely effective services to all its customers. According to a survey conducted by Netcraft in April 2012, Symantec had issued the highest number of active SSL certificates in the world. 811,511 to be exact, installed SSL certificates that year put them ahead of the nearest competitor by a difference of more than 200,000 certificates. This clearly indicates Symantec’s leadership in the market of global SSL certificate. Current data has sustained Symantec’s market position which deepens the trust organizations have in Symantec. Both these terms go hand in hand when we are talking about Internet Security. Certificate Authorities like Symantec go through highly meticulous audits to earn the recognition of a ‘trusted issuer’ of digital certificates. Before issuance, every certificate offered by Symantec is vetted carefully. No partners or third parties take up this verification process on behalf of Symantec. Choosing a Certificate Authority is very important. Here, you need to know that its root is trusted in browsers and that the CA has reputation that will enhance the trust. Apart from these efficient traits mentioned above, there are also few a Additional Features that add up to Symantec’s credentials. Strong Browser Compatibility: Symantec certificates are nearly 100% compatible with all the mobile and desktop browsers. Revocation & Replacement for Free: For all the certificates with same SAN numbers, revocation and replacement is available with management console free of cost. Symantec Trust Center Account: With a mere login you can now view the status of your order, manage malware scanning, renew an expired certificate or download a backup certificate. SAN Support: With Symantec, you can now include as many as 24 additional domains in the field of subject alternative names for Unified Communications and other uses. Installation Checker: Part of our free SSL tools, this applet is used to verify the correct installation of an SSL certificate. Internationalized Domain Name: You can secure your websites with IDN support. Unlimited Server Licensing: You can purchase licenses for multiple servers by hosting a single domain name. They are used for redundant server backups, server load balancing and SSL accelerators. This little black checkmark on an yellow circle has a capacity to incur a tremendous amount of trust coming from millions of web-users across the world. As per the Consumer Research, January 2011, the Norton Secured® Seal is recognized by almost 77% of consumers, when compared to other competing trust marks that are available on the web. Assuring more than 40 million Norton Safe Web consumers that the site has been authenticated by Symantec, Norton Secured Seal offers significant value to Symantec customers, who display it. It is apparent after looking at the increase in consumers’ confidence & sale and a subsequent decrease in shopping cart abandonment. Over the years, the correct usage and placement of seal on the websites have built the value of the seal by establishing a familiar mark which is preferred by consumers. The Norton Secured® Seal, when displayed on a website, a strong message is sent across that suggests that end-users’ identity will be protected by Symantec Internet Infrastructure. However, the placement of this seal on the website is also a significant aspect. Website owners need to place it on the site wherever it is that the visitors need to be assured about the site’s authenticity and security. Symantec brand, in association with Norton provides all the consumers the ultimate confidence which is needed to execute online transactions and other activities on the Internet that requires integrity. All SSL certificates by Symantec come with this feature of ‘Seal-in-Search’ as a standard. This technology displays Norton’s Secured Seal placed next to your company details when you launch a search in a search engine. Among all the other results listed by the search engine, the website with Seal-In-Search stands out. This leads to an increased number of click-through, sales and conversions. In fact, as per Symantec US Online Consumer Study, February 2011, 94% of people say they are more likely make a purchase after looking at Norton Secured Seal. Along with the rise in cases of identity theft and cyber crimes, customers’ reluctance has heightened to browse a website that doesn’t look safe to them. Norton Secured Seal are viewed about half a billion times a day on more than 100,000 websites across 170 countries. This seal-placement suggests that that website is trusted by Symantec™. This increases the clicks for that website by almost 18.5%, as per TheFind.com. As we explore the extensive range of certificates offered by Symantec, the top-notch services and excellent variety offered here makes it quite obvious why Symantec achieves highest number of SSL certificates issued worldwide. Enable Server Grated Cryptography (SGC) with this certificate to ensure strong encryption. Get the Green-URL confidence with this certificate. Encryption Strength – minimum 40-bit to 256-bit maximum. Protect your business against cyber threats with Symantec’s Secure Site Pro. Safely distribute your trustworthy code on the web as an individual. Its traits and benefits are same as that found in thhe regular Code Signing Certificate mentioned above.